Thank you to Victoria Marston, co-author of Citizenship Today for the following blog post. PRACTICE PAPERS: In class, work through sample assessments. Once on study leave, students can use feedback from your marking to repeat practice papers in their own time. ROUND-UP OF NEWS: Ask students to set a phone alarm once a day to look at www.bbc.co.uk/news for five minutes. Each day, they should screenshot an image/headline from a story relevant to their Citizenship exam – keeping all the images in one folder. This folder will be a superb visual trigger in the days leading up to Paper 1 and Paper 2. EXAM BOARD EXEMPLARS: Use this NEW EXAM BOARD RESOURCE to highlight how students’ real-life answers are marked by examiners. Once pupils are familiar with the mark scheme, they’ll have clearer goal posts for both exams. PARLIAMENTARY EVENTS: The easiest way for teenagers to keep track of these is through following their own MP. All MPs’ websites show national news as well as locally-focused events. They can search for their MP here. ACTIVE CITIZENSHIP: Students need to put across Theme E (Taking Citizenship Action) details very succinctly on exam day. Ask them to summarise their citizenship action in no more than 150 words then explain it to someone in the class whom they don’t often work with. This partner should ask probing questions about teamwork techniques, research methods, and pitfalls/successes experienced. RECOGNISING OTHER VIEWPOINTS: Playing devil’s advocate is crucial for the 15-mark questions. In circle time, challenge pupils to spend 30 seconds arguing against an issue of which they are actually in favour (or vice versa). Topics guaranteed to get sparks flying include lowering the voting age, legalising cannabis, solutions for tackling long NHS waiting lists and university tuition fees. ENLIGHTENING SOCIAL MEDIA: Every teenager – whether they admit it or not – is passionate about some current affairs issue. Encourage students to follow four new people/campaigns on social media between now and the exams, each linked to one of Themes A-D. For example, following #BlackLiveMatters is relevant to Theme A (Living Together in the UK). See p.7 onwards for a breakdown of topics within each theme. The pre-exam period is also a great chance to get parents/carers on board with revision, via a quick group email: encourage them all to send you a brief paragraph about how citizenship issues are relevant in their life. A local father might recently have lobbied their MP about school funding cuts; a local mother might be the CEO of a national charity; a local foster parent might make regular visits to the youth court. Close-to-home accounts of how citizenship themes touch lives put the exam into context and are thus very likely to be recalled in the exam. Here’s hoping that the exams on June 15th and June 18th go extremely well for your classes. What with the general election, the EU referendum and the introduction of compulsory gender pay gap reporting, there has been no shortage of fascinating themes to explore within the new specification! 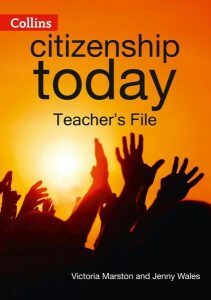 Remember that this time of year is ideal for using the Collins Edexcel GCSE Citizenship Today Teacher’s File. With dozens of photocopiable worksheets and lesson plans at your disposal, it couldn’t be easier to split the class up into focused revision groups (according to who has which knowledge gaps).